Areas surrounding Lafayette offer camping options unlike any other. While the camping season can be somewhat limited by the heat and humidity of our summers, those willing to brave the elements are rewarded with the chance to experience unique ecosystems and wildlife and will likely have many areas all to themselves. No matter where you end up, be sure to bring bug spray and plenty of water, particularly in the warmer months. Also, beware of some of our more dangerous wildlife, such as cottonmouths, water moccasins, and even the occasional alligator! A short 10-minute drive from downtown Lafayette will bring you to Acadiana Park which, in addition to its 2.5 miles of hiking trails and Nature Station, also houses a small campground that is your only option for camping without leaving town. The lightly used, generally quiet campground offers 75 campsites, most of which accommodate RVs, and a few designated as tent only. It is an excellent spot for a quick getaway, to introduce children to camping without being too far from home, or to get away from the city if you’re in town for one of our many festivals! Campsites run $25/night. For more information and a campground map, call (337) 291-8388. You will have to leave a message, and someone will return your call. Located 30 miles south of Lafayette, Palmetto Island State Park is relatively new to the state park system, having opened in 2010. The area is a great example of a coastal bottomland hardwood forest ecosystem, and true to its name, is home to an abundance of Dwarf Palmettos, a species of palm native to wetlands in the southeastern and south-central US. The park has improved campsites with water and electrical hookups, but the walk-in backcountry campsites are the real gem here. The sites are adjacent to a small pond and are small pockets of open space in a densely wooded area, well hidden from the other nearby sites. To the seasoned backcountry camper these sites are perhaps not of interest as a true backpacking trip, but for a family introducing backpacking to children, or someone wanting to test out some new gear without being too far of a walk from the car, these offer the perfect solution. Backcountry sites are $9/night per person, and improved sites are $20-28, depending on the day of the week and time of year. During your stay, rent a canoe (or bring your own) to explore the park’s canoe trails or the Bayou Vermilion. You should also walk the short (0.7 mile) nature trail, and see if you can spot Iris nelsonii, the Abbeville Red Iris, endemic to the area and one of Louisiana’s five native iris species. Call (337) 893-3930 or click here for more information. Following the levee along the western edge of the Atchafalaya Basin will bring you to Lake Fausse Pointe State Park, where camping can be a whole new kind of adventure. Located 35 miles southeast of Lafayette, the area was once part of the adjacent Atchafalaya Basin and shares the same landscapes and ecosystems as the larger bottomland hardwood swamp. 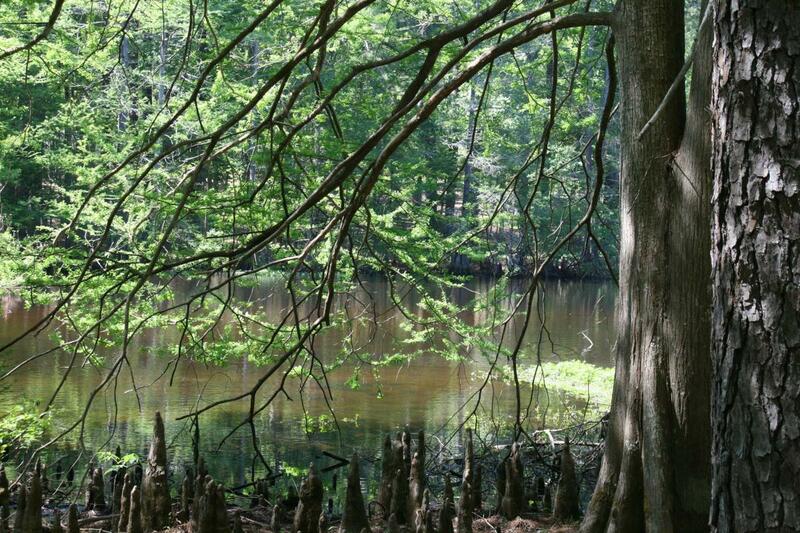 In addition to your typical state park improved campsites with water and electrical hookups, Lake Fausse Pointe has several primitive backcountry sites, including five sites that are only accessible by boat. Bring your watercraft, or rent canoes, kayaks or flat bottom boats from the park for your outing into the swamp. Canoe campsites each have a small dock, a table, and fire ring, but make sure to pack in your food, fresh water, and bug spray. Cano campsites are $18/night, backpacking sites are $9/night per person, and the cost of improved campsites in the park range from $20-33/night depending on amenities, the day of the week, and time of year. For more information about camping options and fees, click here or call (337) 229-4764. Indian Creek Recreation Area, about an hour and a half from Lafayette in Woodworth, LA, is one of the best places in the area for tent camping. The park is adjacent to the Indian Creek Reservoir, and the primitive tent camping sites are all somewhat secluded and most have fantastic views of the water. These sites are first come, first served, and run $14 per night. While there is no water or electricity at the sites, the primitive area has two latrines with water stations available for camper use. Campers may also use the showers located in the RV section of the park, as well as other park amenities, including swimming beaches, picnic areas, and a 3.2-mile hiking trail. For more information on the park, call (318) 487-5058 or click here. Though spread over eight parcels of land in five ranger districts in the central and northern parts of the state, Kisatchie National Forest offers some of the state’s best camping. The Kisatchie Ranger District and the Evangeline Unit of the Calcasieu Ranger District are home to some of the most popular campsites. Each campground varies in terms of facilities and pricing, but most sites are first come, first served, and are paid for at self-service kiosks, so make sure to bring cash. A longtime favorite among campers is Kisatchie Bayou Campground, one of the state’s most scenic, situated along a clear, sandy-bottomed bayou that runs through hardwood and pine forest. Hiking and fishing are popular here, and the campground can get crowded when the weather is nice. Note that the site has restroom facilities, but there is no water source at this campground, so make sure to bring plenty with you. 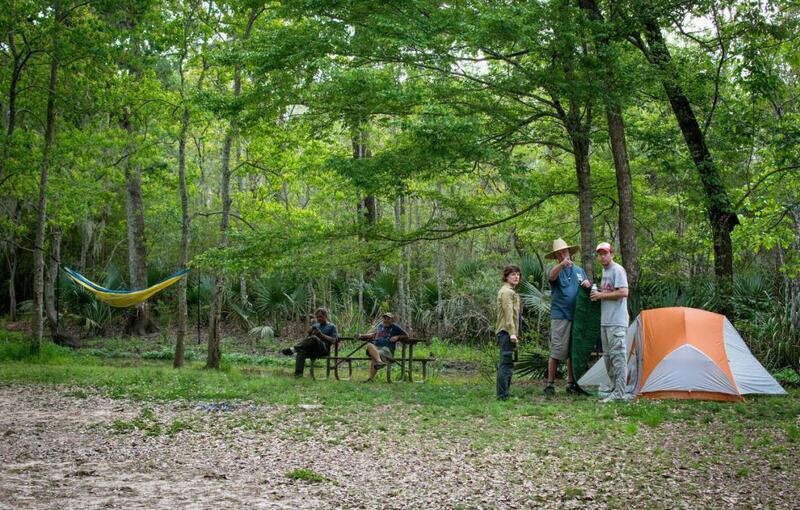 A bit closer to Lafayette is the Evangeline Unit of the Calcasieu Ranger District, where plenty of options for camping await. 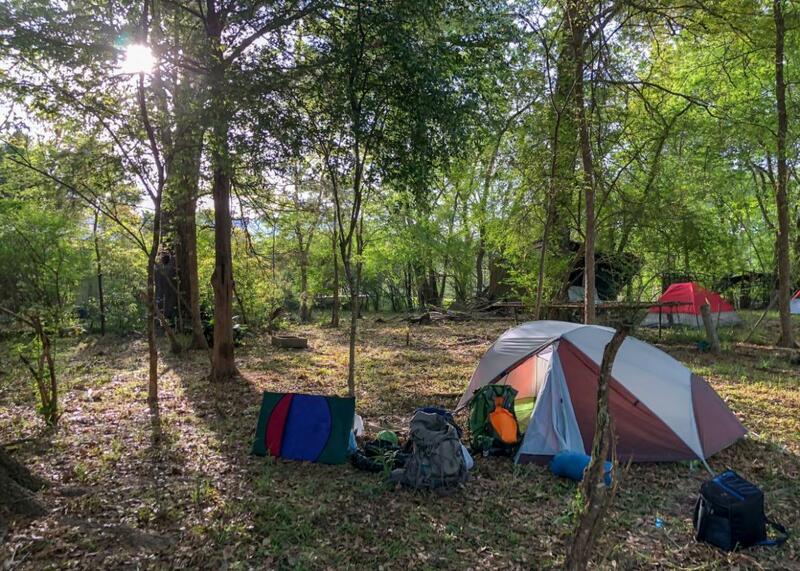 If you’re looking for a backpacking experience, the Wild Azalea Trail is a 26-mile point to point trail along which you can camp, making a fantastic two or three-day overnight trip. If car camping is more your style, check out the Kincaid Lake Recreation Complex. This area offers two campgrounds with improved campsites ($15/night), as well as a primitive camping area ($10/night). Kincaid Lake Reservoir offers excellent fishing, hiking, and biking. Additional information on these campgrounds and others in each of Kisatchie’s ranger districts can be found here. It’s your public land, make use of it! Longtime Lafayette outfitter Pack and Paddle has all the camping gear you need to make your next trip a success. Their website also has information about places to go for your next outing. Another local outfitter, The Backpacker carries a large selection of camping gear. Stop in the shop or visit their online store to stock up on the things you need before setting out. 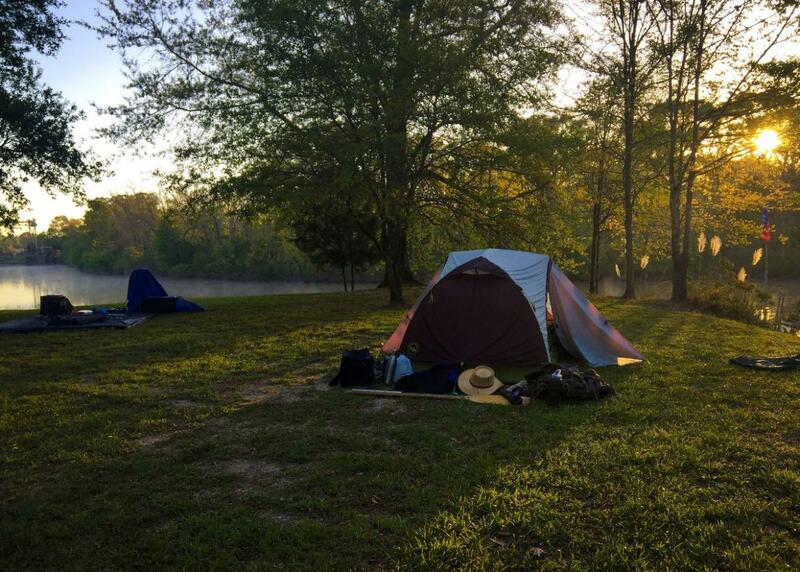 For information on camping in all of Louisiana’s state parks, visit their website by clicking here.